Fishing Trips are for up to 4 people, each additional passenger (Max 2) please add $50.00 per person. All trips are weather permitting and at the Captains discretion. Some Departure Times are Flexible. Trolling or bottom fishing within approximately 5-15 nautical miles from shore. Times 7-11 am or 1-5 pm. Please contact the Captain for availability prior to Paypal Payment. 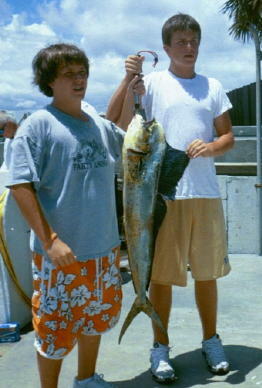 Trolling or bottom fishing within approximately 10-15 nautical miles from shore. Departure times vary 7-11 am. Trolling or bottom fishing within approximately 15-35 nautical miles from shore. Typical Times 7 am - 3 pm. Trolling or bottom fishing within approximately 25-50 nautical miles from shore. Typical Times 7 am - 5 pm. Ash scattering out the Inlet to the Bell Buoy to lay your loved one to rest for a maximum of 6 passengers. Usually 2-3 hours Total Time. Day and Evening River Cruises are available for 2-6 passengers in 2 hour increments. Please contact the Captain for availability and times. 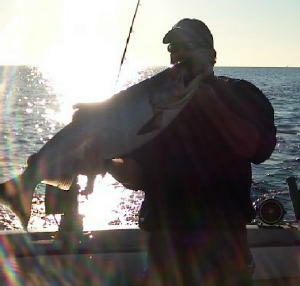 Custom Charters are also available. Please contact The Captain with your requirements. Boat and Captain are available for Pleasure Cruises both inland and off shore again please contact the Captain for Rates. Please click on the "RATES" link above, or if you prefer you may call Captain Tim at 386-547-3179 to make reservation and customize your trip. Please understand he is very busy and works long hours, so your call may not be returned the day you make it depending on his charter schedule. But he will return all phone calls ASAP for him. All you need to bring is your food, drinks, and snacks. We also recommend you bring a camera, sunscreen, hat, sunglasses, polarized if possible, and maybe a long sleeved shirt to protect yourself in case you get too much sun. Please wear deck shoes or soft soled boots in the winter. We provide all the tackle, bait, ice, license, etc. Should I eat before my trip? Yes, but have cereal or toast, avoid doughnuts or greasy foods. Should I take motion sickness medicine? If car or airline travel bothers you, we strongly suggest that you do. Please get non-drowsy type, and follow the directions. It seems to work best if taken night before, and then about a hour prior to your departure. Also, please get a good nights rest, thats very important. We offer fish cleaning back at the dock, and charge accordingly. Yes, Capt. Tim can refer you to a taxidermist. It is customary to tip 10-20% of your trip price. Capt. Tim and his mate will do their very best to make your trip as enjoyable as possible. Please feel free to email Captain Tim, he will be happy to respond to any questions you may have. Thank you for visiting the Fastlane website, hope to see you real soon.